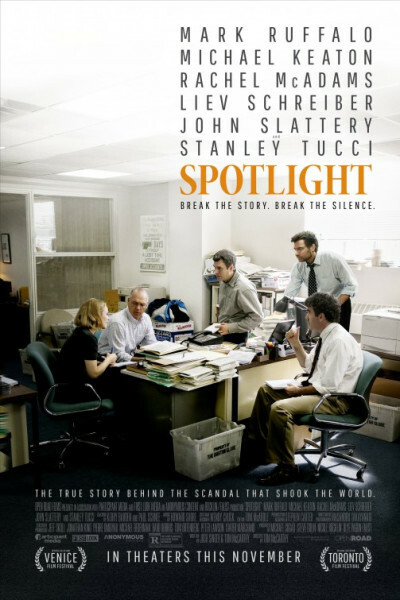 Spotlight is a pretty dang great movie. I particularly enjoyed its plodding, procedural nature. It's not flashy, never reaches for the stars, simply puts one foot in front of the other and builds, builds, builds, layer by layer, until you are entirely seduced and converted. Unlike, say, Truth, which was so ham-handed as to be annoying, Spotlight keeps it simple and wows through, well, truth. It's factual, not fancified, and everyone in it is sublime: Keaton, McAdams, Ruffalo, Slattery, Schreiber, Tucci, Crudup, everyone. Ruffalo is perfect. Like Room, I think it will remain a small and understated affair at the box office, but come Oscar time, I expect to see someone rise up from within its ranks and cross the stage for a little gold man.